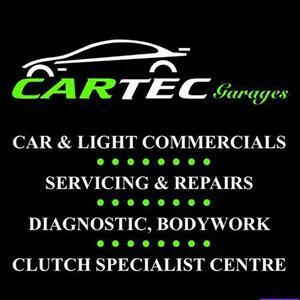 We at Cartec Garages Ltd located in Brierley Hill offer professional and friendly service. We can do almost any type of work including: fast fit clutch and brake centre, diagnostic specialists, cam belts, engine work and rebuilds, servicing and repairs, MOT's. Car and light commercial servicing and repairs diagnostics, body work, all work fully guaranteed. Fast and friendly service so why not request a quote today? Garage was excellent with first class service. Final price for the clutch was as quoted with no extras. I would thoroughly recommend this gararge & will be using them for all future work due to their transparency & honest approach. Booked my car in quickly and easy and diagnosed the problem. Would really recommend this garage!